Users of Recorder 6, the software for entering, collating and exchanging records of species and habitats, will now be able to easily import data entered with Eco:Map. 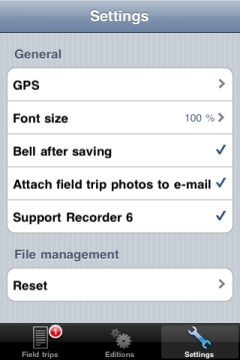 In the settings of Eco:Map select Support Recorder 6. You are now in the Import Wizard. As a template use <none> and accept all other settings. Click on Next. You are now on the page Data. Choose First row contains column names. Press the button Validate Columns. Select now all other desired settings and import your Eco:Map data into Recorder D.